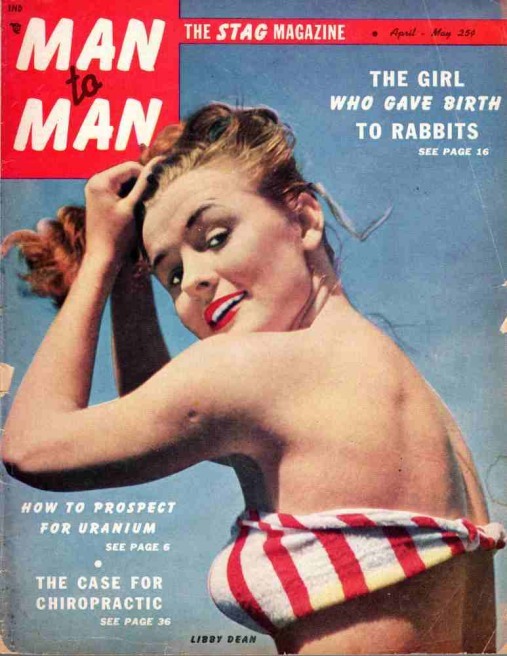 In this post I consider 3 articles published in the 1950s in magazines intended for men. 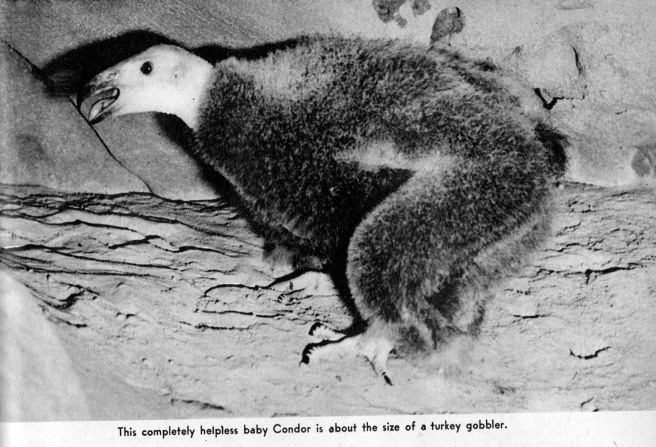 The articles provide insights into how the California condor was (or was not) understood by one segment of the public at the middle of the 20th century. For context: The magazines under consideration are less “racy” than the magazines sold today in supermarket checkout aisles. Their content includes a mix of non-fiction, fiction, single-panel cartoons, and photography. Adventure, get-rich-quick schemes, and sports are major themes of the writing. Most of the advertising is not for major companies. The paper is low-quality. 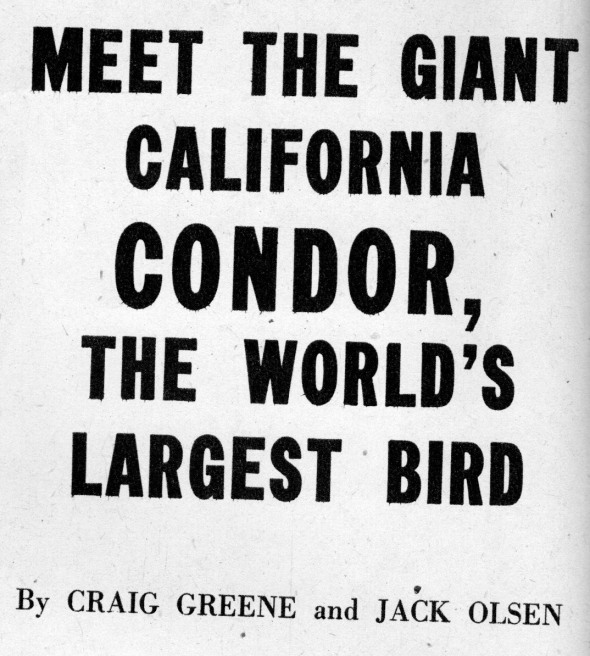 The April-May 1950 issue of Man to Man includes “Meet the Giant California Condor, the World’s Largest Bird” by Craig Greene and Jack Olsen. 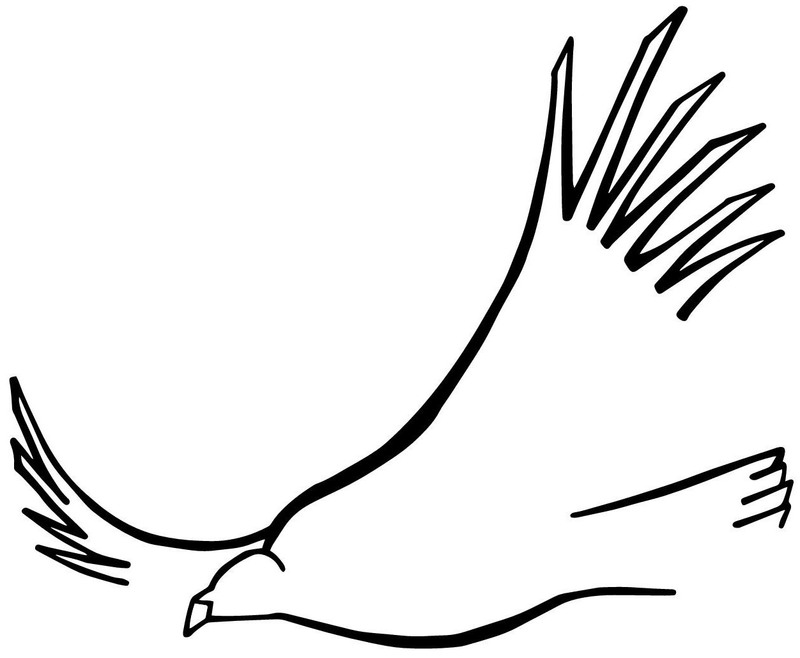 … the Condor – nature’s original conscientious objector – will not kill, even to eat. He dines only on carrion. One might think this largest of the world’s birds would have been carefully protected by man. The condor harms no one, keeps the valleys clean of carrion, provides a spectacular sight as he soars high among the clouds. But still he has been slaughtered nearly to extinction. Why? Man, we fear must take sole blame for the near extinction of the California Giant Condor. Ranchers settled in the valleys below the Condor’s eyries threw out poisoned carcasses to kill coyotes and mountain lion. It was thought at one time that these poisoned carcasses were killing the Condors, too. But a strange fact has come to light. Condors are immune to poison! Something about the way their stomachs work makes them able to eat the strongest death-dealing potions with no apparent ill effects. Just a big, hungry glider with feet – that’s our bird. 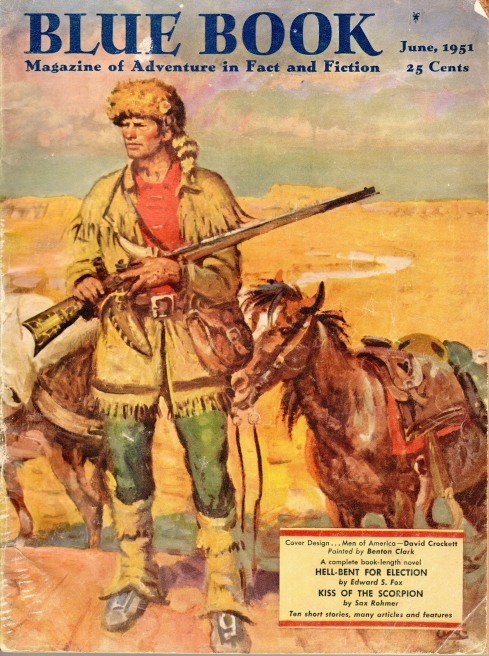 Argosy magazine’s August 1956 issue included “Condor Hunt” by Walt Wiggins. There is a mention that live specimens are auctioned off to zoos. However, this article is about telling the tale of a “battle”, not an account of acquiring specimens. The article is focused solely on the Andean condor; no mention is made of the California condor. So it is probably fortunate that the California condor does not receive a mention from Wiggins. The 3rd article, from Blue Book, a “magazine of adventure in fact and fiction”, is a significant step up from the articles in Man to Man and Argosy. Blue Book has no advertisements or images of women in swimsuits, and the prose is down to earth. “Condor’s Don’t Pay Taxes”, by Alvin M. Josephy, Jr., is a substantial, readable article in a journalistic style. The framework for the piece is the conflict between the preservation of California condors and development of mineral resources, and the debate over establishing a condor sanctuary in Ventura County. Along the way there is history of the human-condor relationship and natural history. The oil men were incredulous that a mere college boy was responsible for their troubles. The very idea galled them, yet as they realized that it was going to be the birds or themselves, they hastened to the conclusion that Koford had to be contended with as a major enemy. I don’t know whether Josephy or those “oil men” came up with “mere college boy”. It should be noted that, by the time Josephy’s article was published, Koford had earned his Ph.D. from the University of California, Berkeley and served in the Navy during most of World War 2. Despite that title, article is a balanced account for its time and, having just reread it, this piece does not really belong in the same category as the articles in Man to Man and Argosy. 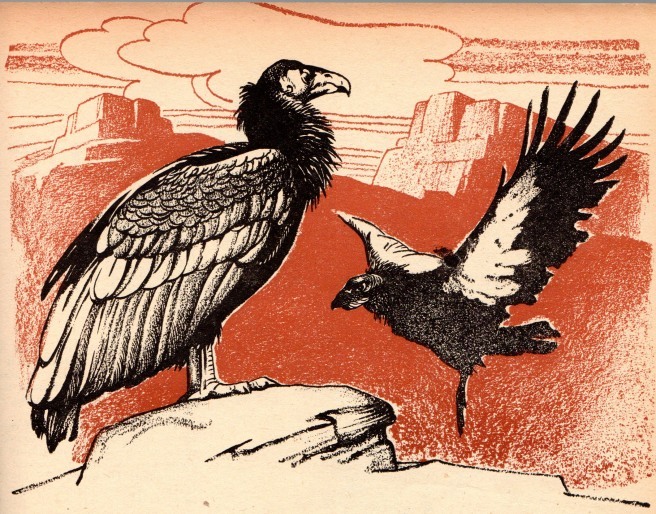 Burger also provided illustrations of California condors for a short story in Boys’ Life magazine (see the post: Boys’ Life: 1942-1999). Alvin Josephy’s role in the human-condor story was not limited to his Blue Book article. He also co-wrote the screenplay for a major Hollywood movie in which the California condor plays an essential part. I will write about that movie in a future post.